My feta obsession continues with this recipe for flavorful Mediterranean pasta with pine nuts and feta. It’s another quick and easy meal that comes together in about the time it takes to cook the pasta. And, because it has cheese, vegetables, nuts, and carbs it’s a filling main dish (although a side salad never hurt anyone). I was originally inspired by this recipe from the March, 2011 issue of Cooking Light Magazine. The ingredients are basically the same, but the quantities are all different and I omitted basil while adding lemon juice and balsamic for a bit of acidity. I also used fresh red peppers instead of roasted, and I enjoyed the bite that it gave to the dish. Finally, instead of toasting the pine nuts separately, I just added them in with the onions and peppers, which allowed them to get a nice golden brown. Inspired by the flavors of the Mediterranean, this simple, quick weeknight pasta is likely to be in frequent rotation once you give a try. It's hard to go wrong with garlic, onions, peppers, pine nuts, and feta. Cook the pasta in a large pot of salted water until al dente. Drain, reserving ½ cup pasta water, and put aside. Meanwhile, heat the olive oil in a large pot over medium heat. Add the onions, pepper, and garlic and cook until quite soft, stirring often. Add the pine nuts and cook until toasted and light brown. Add the pasta, lemon juice, balsamic, and a splash of reserved pasta water. Toss to coat. Add the mint and feta and season to taste with salt (go easy as the feta is salty) and freshly ground pepper. Toss and serve immediately. You and I are thinking along the same vein…I have peppers, pine nuts and feta in my fridge waiting to become something yummy. I will using rice, though. Ooh rice would be great too Kristen, great idea! I love roast red peppers, but usually just use fresh – it’s so much easier! Particularly in a dish like this, and combined with the lemon and balsamic vinegar, I think the more assertive flavor of the raw peppers would work better. Nice combo of flavors – I’ll bet the feta tasted great. Thanks! Me too! I do love roasting peppers, but I agree the raw peppers worked really nicely here. Thanks! Katherine, your pasta looks delicious! What a bright pasta! I bet is delicious! 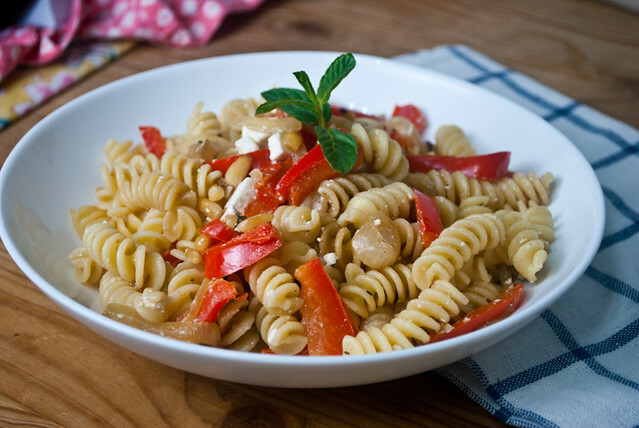 We are BIG feta fans as well and often add it pasta. Looks like a very tasty recipe. I see we’re on the same page Judee! 🙂 Thanks! Thanks Bridget! It’s a perfect weekday meal, it’s so quick and easy. Love the simplicity of this pasta. Was checking your featured page today and found that you have many feathers in your cap. This looks delicious! Like you – I’m a fan of Feta cheese! …there’s something about that salty, creamy taste that I can’t resist! Oooh yes, you are so right Carolyn! Great idea. This looks clean and super fresh. I love feta and all it does to a dish! Thanks Gerry! Feta really is a wonderful and versatile ingredient. Thanks Liz! It’s exactly my kind of weeknight meal. Awesome! I’ll have to check yours out Ewa 🙂 Hard to go wrong with this flavor combo. Haha it certainly is! Hope you enjoy it as much as I did! Very simple yet lots of flavors from each ingredients. Your pastas look always delicious. So hard to control my carb craving!! Aw thanks Nami! I know, I’ve cut back a lot on pasta in recent years – growing up we ate it every single night, no joke. Use whole wheat pasta! it is a common misconception that carbs are bad for you. Great point Rachel, thanks! As mentioned, I grew up on a very (non whole wheat) pasta-heavy diet and everyone in my family is quite slim and healthy. That being said, I have diversified my diet a lot and now eat pasta only about once a week, if that. I’ve never been one to diet, and I believe in everything in moderation. Congrats on the top 9!!! Haha thanks Sandra! I feel the same way about pasta – and feta! I adore pine nuts, and who can resist fresh feta? 🙂 Great, simple dish I’d love to enjoy anytime. Looks wonderful, a very elegant pasta dish love pine nuts. Congrats on the Top 9. Have a wonderful day. Thanks! Feta really is an amazing cheese. I just love it! Hi Katherine! I love this pasta! Congratulations on the Top 9! I love this pasta dish. I made some feta the other day and it’s screaming to be paired up with all these lovely ingredients. Can’t wait. This is so delicious! I decided to add in some olives and it really turned out awesome. Thanks for the recipe it’s wonderful!